The Rev. Milton Stohs is the recipient of the first Henry F. Wind Award, which recognizes outstanding leadership in Specialized Pastoral Ministry (SPM) in the areas of advocating and promoting chaplaincy, pastoral counseling and/or clinical pastoral education. The Rev. Dr. Henry F. Wind (1891–1966) was the first executive secretary of the LCMS Department of Social Welfare, which operated from 1953 to 1967. 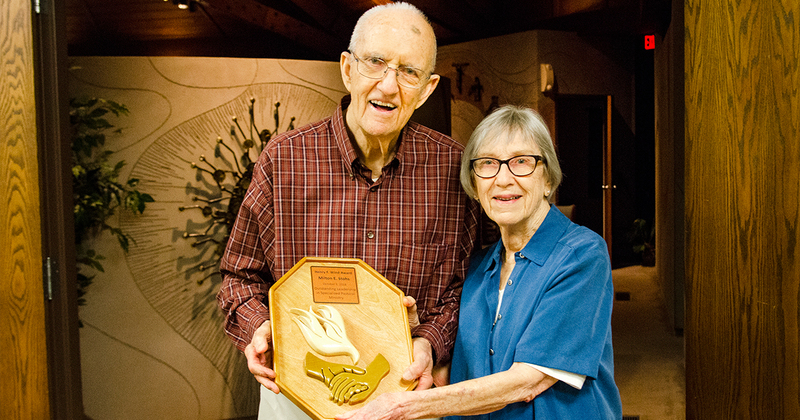 Stohs, 89 and living with Parkinson’s disease, served in SPM for more than 30 years, primarily as executive director of Lutheran Mission Association (LMA) in St. Louis from 1964 to his retirement in 1995. He received the Wind award Oct. 3 during a Lutheran Church—Missouri Synod (LCMS) SPM educational event in Belleville, Ill.
Reading the first two paragraphs from his prepared acceptance speech, Stohs noted “my voice is not as loud or clear as it once was,” so his daughter, Carolyn, finished his remarks. Before the presentation, Stohs said being selected for the award was “very humbling and I don’t feel worthy of it,” but he was appreciative all the same. At LMA, Stohs oversaw a ministry that provided chaplaincy and ombudsman services to St. Louis city and county jails, hospitals and nursing homes, and created ministries of support for the families of inmates and ex-offenders. Stohs, however, didn’t confine his obligations to an office desk. He provided material and spiritual care among the poor and marginalized, and even lived homeless for one weekend. Stohs says he always leaned toward working in specialized ministry, but his devotion was stimulated while he was a student at Concordia Seminary, St. Louis, in the early 1950s. He worked as a chaplain at Barnes-Jewish Hospital in St. Louis and at St. Louis city and county jails. In addition, he served a vicarage with the Twin Cities Mission Society in St. Paul, Minn., which included conducting Sunday services for immigrants, visiting tuberculosis patients at a hospital and teaching religion classes to youth at a detention center. After receiving his Master of Divinity in 1953, Stohs served two parishes before being called to St. Louis. He first served in Cocoa, Fla., for nearly nine years, a call that he found both “challenging and exciting.” Brevard County — known as the “Space Coast” due to the rocket and missile launches from Cape Canaveral — was the fastest growing county in the United States at that time. In his remarks, Stohs recalled an incident when his congregation’s leaders refused to allow African-Americans into their church to listen to an LCMS missionary to Africa. The visitors met the guest missionary in the parking lot instead. It was his tireless work in that next ministry that led to the Wind award. Read more about the Henry F. Wind Award. Frank Kohn (frank.kohn@lcms.org) is a designer, writer, copy editor and photographer with LCMS Communications.